I’m not going to list the names of the people shown here. I figure that after 35 years, they deserve the option of anonymity if they so desire. But that’s me with the glasses and the wristwatch, in the company of a bunch of awfully talented people. It was the spring of 1979. I was an earnest but inexperienced actor. My complete resumé at the time was this: Two high school shows, two college shows, four community theater shows, and a lifetime of trying to entertain people. And then… a moment occurred; a moment when everything changed and the rest of my life began. I didn’t realize any of that at the time, but that’s what it turned out to be. What made this role more attractive than the usual college theater fare was that it was being produced as part of a theater festival to take place at Detroit’s Attic Theatre, which was very prominent and highly regarded at the time. The notion that I might have a shortcut to performing a role at the Attic was all the motivation I needed. I looked up the Attic’s phone number and called to inquire as to the casting situation for A Night Out. I want you to notice something right away about my choice – it was fundamentally flawed. The Attic was not producing this show; the University of Detroit Theater Department was. There was no chance I was going to get hooked up with A Night Out by making this call. But as the saying goes, fortune favors the bold. The person who answered the phone at the Attic was, I later determined, Harlan Moyer, who was one of the theater’s founders and who was at the time married to the Attic’s Artistic Director, Lavinia Moyer. Trying to sound cordial but professional, I asked whether they would be holding auditions to recast the role in the Pinter play for the upcoming festival. Harlan paused a moment to figure out what I was talking about, but he quickly caught up. “Oh, I see,” I replied, suddenly feeling as if I’d been unmasked as a rube. “Yeah, that would be fine,” I said, trying to sound calm. And so my audition time was set. Here’s how ignorant I was about the theater world in Detroit: I’d never imagined that you could simply call up a place like the Attic and schedule an audition. Surely one had to have connections, or maybe even an agent, just to walk in the door. Yes, I was that clueless. And not just clueless, but also… unempowered. The audition day arrived. I walked in not expecting to know a soul there. It was therefore a welcome delight when I ran into Kim Carney in the lobby. I’d worked with her the previous year in Candide at Wayne State University’s Bonstelle Theater, and it was gratifying to see, and be recognized by, someone whom I held in such high esteem. There are different ways to run an audition. Sometimes, we all wait in the lobby while they call us in one at a time. Fortunately for me, this was not one of those times. We all sat in the theater together and watched each other perform. You’ll see in a minute why this was so fortunate for me. This was my chance. With nothing to lose, it was time to be bold again. In leafing through the script, I’d noticed that nobody had done anything at all with the supporting character of Bieberman, and I thought I’d figured out a way to make it memorable. I raised my hand and said, “Yes, I wanted to read the scene where Bieberman is disguised as an old man.” I had a particular funny voice I’d been doing for years that usually got a laugh, so I used it for that scene. And what happened when I did that? Everybody laughed, especially Jim. What more could I have wished for? I’d been noticed! Whether they cast me or not, doggone it, I’d been noticed. A few days later, the phone call came. I’d been cast as Bieberman. I was going to be a professional actor! All sorts of other things happened after that. The show opened in July 1979 on Friday the 13th, but this proved to be no omen of disaster whatsoever. Steambath was the hit of the summer in Detroit theater, selling out most of its performances. Oh, and the laughter! This was one funny show. This considerably softened the blow of my first professional review in The Detroit News: “Charles Greenia seems to not get the joke…” Ah well. Reviews are, after all, an occupational hazard. As with all shows, no matter how successful, Steambath finally closed in early September. A few weeks after that, our director, Mr. Moran, who was also the theater’s business manager, asked me to join the Attic’s Artistic Company and serve as bookkeeper. Even if you have a low opinion of my acting, take this to heart: I’m a far better actor than I am a bookkeeper. It’s a wonder the theater survived my two year tenure in that capacity. By the end of those two years, my life had changed completely. As bookkeeper, one of my duties was to sign all of the actors’ paychecks. Mind you, I had no power at all to decide what we spent money on, but one tends to remember the name that signs one’s paychecks, so after two years of that, just about everyone in Detroit’s theater world knew who I was. More importantly, I’d gotten to do a lot of quality theater with people who were much more artistically evolved than I was at that point. That’s when I learned how crucially important it is to work with people who are better than I am. It can be humbling, but it’s a damn fine way to get an education. Addendum — On the day of the Steambath auditions, there was a cute, diminutive young woman dashing about, delivering resumés to Mr. Moran and generally coordinating things. I took her to be Mr. Moran’s assistant; perhaps an intern of some sort. The following week, I was introduced to her and found that she was in fact Lavinia Moyer, the theater’s Artistic Director. I hoped she hadn’t seen my double-take when we were introduced and I decided to leave my first impression of her unspoken. Still, it set a good precedent for the kind of collaborative environment that the Attic embodied at that time. One final bit of business — I own half a dozen or so pictures from the Steambath photo shoot, but this one stands out. It’s me again. I’m not going to give you any context for it. 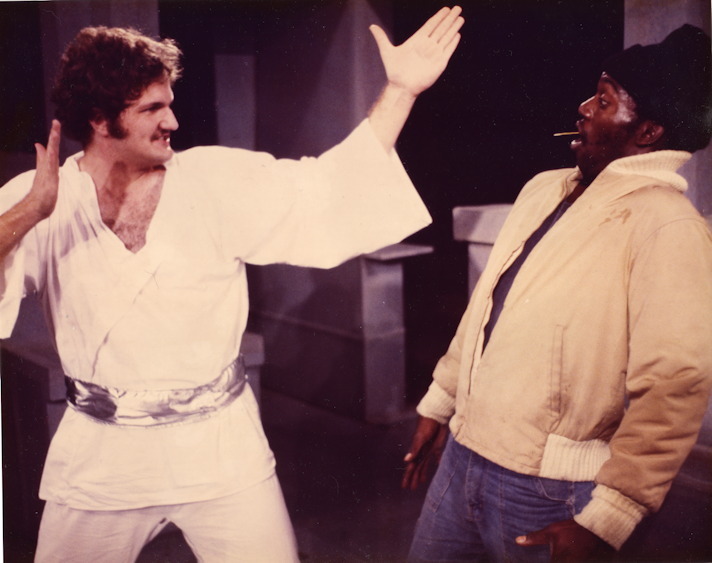 Suffice it to say that my character was not a master of the martial arts, and this was the only scene in which I was not attired in boxer shorts and a towel. Not sure who posted this comment, but thanks for checking in!